A patient is shown wearing the ambulatory blood pressure machine in the photograph. 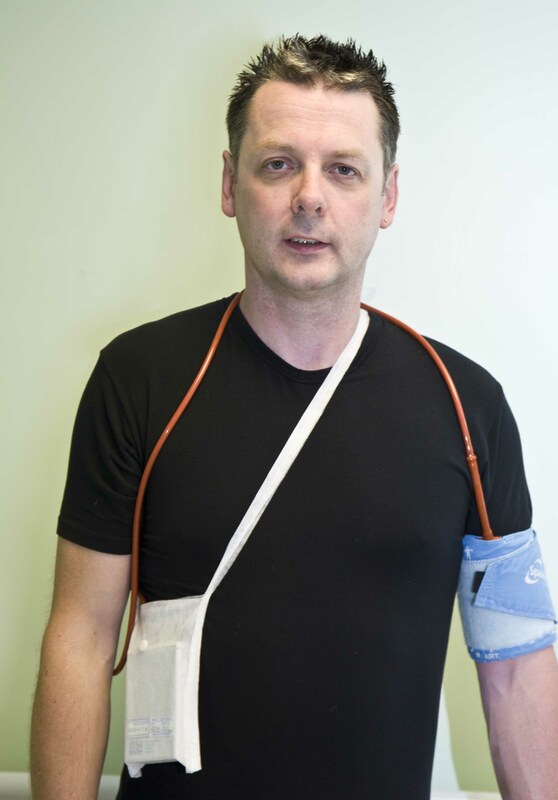 The cuff is usually placed around the upper left arm and the tube connecting to the monitor is run around the back of the shoulders and connected to the monitor which is supported in a sling positioned around the neck. The monitor is both light and small and easily concealed below loose fitting clothes. The monitor not only incorporates a solid state recorder but also has a small pump which inflates the cuff about every twenty minutes during the day and about once an hour overnight. This gives about 60 to 70 readings in an average twentyfour hour recording which can help to determine whether someone trully has hypertension or whether they have reactive (white coat) response to having their blood pressure measured in a formal 'office' setting at the hospital or GP surgery. Serial recordings may also be helpful in determining efficacy of treatment, particularly in those with 'white coat hypertension' in whom the readings taken at hospital or in their GP's surgery may be artificially raised. The print out from the monitor shows that throughout the whole 24hr period the blood pressure is within the normal range. More frequent readings are seen during the waking hours as we normally set the device to take readings every twenty minutes during the day but only once an hour during the night so as to be less likely to disturb sleep. 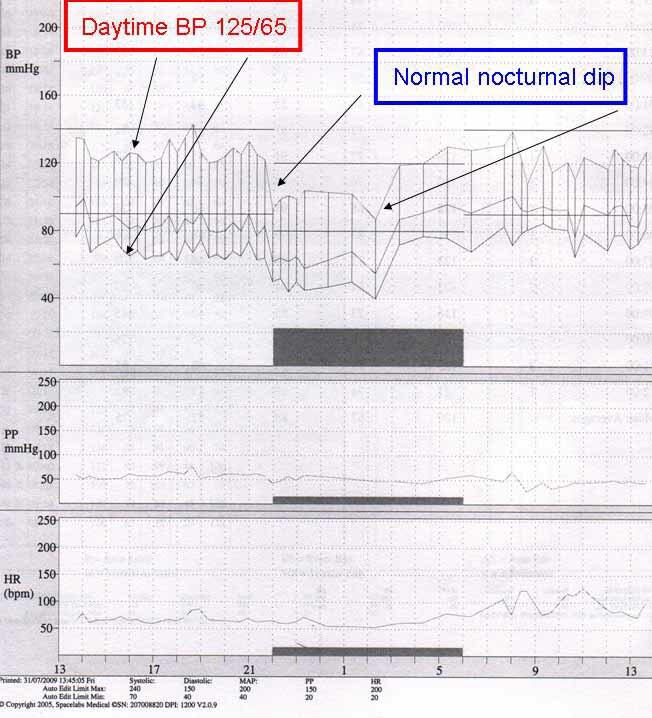 This recording clearly demonstrates the normal 'nocturnal dip' seen in people without established hypertension. 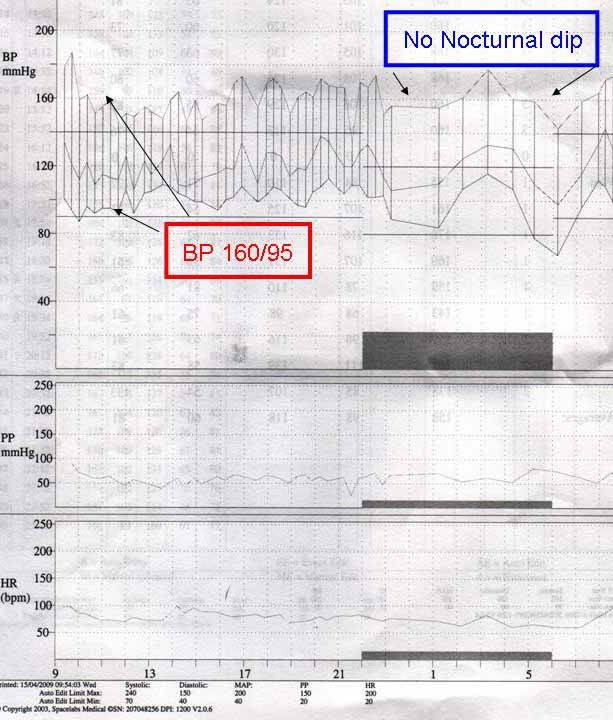 In the print-out from the monitor on this patient you can see that the initial BP when the monitor was put on in the cardiology department was 168/84 mmHg. However, as the recordings continue throughout the day it is clear that within an hour of leaving the hospital that the BP is very much within the ideal range with the systolic BP fluctuating between 120 and 130 mmHg. A second feature is that the BP is clearly much lower during the sleeping hours (23:30 to 07:30) before returning to the daytime pattern on waking. This is a normal feature. 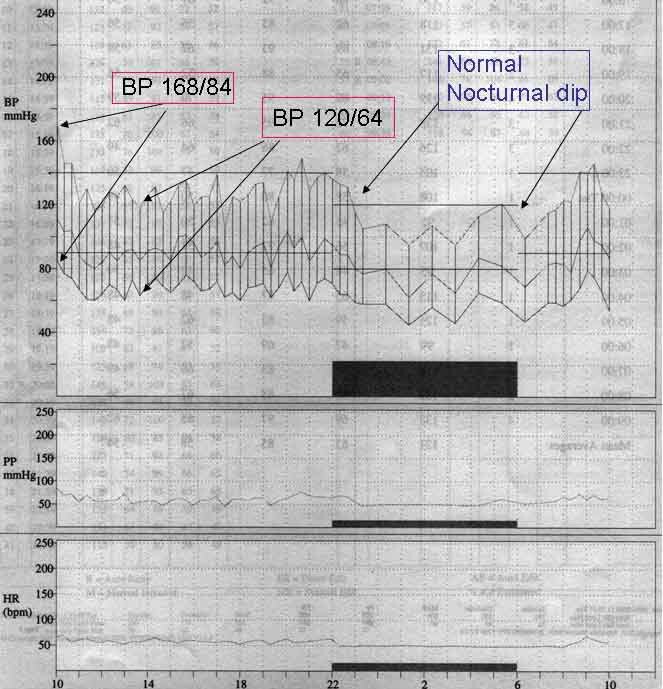 People with established hypertension will not only show high blood pressures throughout the day but will also show a loss of this normal nocturnal dipping in blood pressure.